“Why don’t you have a tan?” This is the question Dr Cath Andrews is always asked on returning home to the UK from Mexico. It seems that Mexico lives in the British imagination as a tourist destination, where the sun always shines and all residents must have time to sunbathe. Cath explains that living in Mexico is very different to visiting as a tourist. I live in Mexico City, many hundreds of miles away from the sea. I work full-time and my children are at school. We go to the park a lot in the evenings and weekends and occasionally go to the seaside for holidays. But there is not much chance of having a full-time tan this way! Sadly, my life here is very much like it would be in the UK, which is a shame because I came here for the adventure of going somewhere so different from my home. Living here has made Mexico seem anything but exotic. My children, on the other hand, are fascinated by the idea of the UK. They want to know whether it snows all the time. They can’t believe that the beaches don’t have palm trees or that it might actually be cold on a beach. Exotic, then, seems to be something that is not like things you are used to. All that said, Mexico is a fascinating country. It was colonized in the sixteenth century by Spain and its population is now made up of a variety of people: some descendants of the original residents, or indigenous peoples; some descendants of the Spanish; and others descendants of a mixture of the two. This means that although Spanish is the official language, there are also 85 indigenous tongues. The majority of indigenous people live in the centre and south of the country. Compared to the UK, Mexico is not a rich country. Until the end of the last century, it was mainly a rural society. However, in the last fifty years, this has changed. Now nearly 70% of Mexicans live in towns. This means that life for children has generally improved greatly. In 1970 only 65% of children went regularly to school. In 2012 this figure is nearly 95%. Children can start school –or kinder as they call it- at the age of three. Kinder lasts for three years. At 6 children start primary school and at 12 they go to secondary school. Just like in the UK, it is normal for children to wear a uniform to school. However, most schools are still very traditional and don’t let girls wear trousers as part of the uniform. Among little children’s favourite days are 24 December and 6 January because they generally get given presents! You can guess that it is Santa Claus who brings presents on 24 December, but did you know that the Three Kings bring children gifts on 6 January? You have to leave your slipper or shoe out when you go to bed and the Kings will fill it as they go past! For older children and teenager, one of the most interesting times of the year are 1st and 2nd of November when Mexico celebrates its Day of the Dead (Día de los Muertos). This is an indigenous custom that was adopted also by the Spanish settlers. 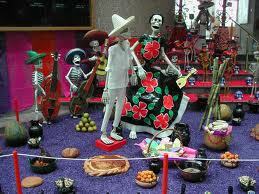 Every year families make an altar decorated with flowers, paper decorations and sweets made out of skulls! The altars are made to remember family members and friends who have died and also usually include the dead person’s favourite foods. Mexicans believe that on the night of 1st November deceased children return to earth to visit their families once more and eat with them; on the night of the 2nd, it is the turn of the adults. Lots of families make their altars in the graveyard and spend both nights there waiting to see their loved ones. 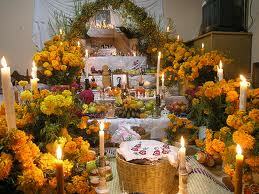 In schools each class makes their own altar and often there is a prize at the end for the class with the best altar. I once had the honour to be the judge of an altar competition at a friend’s school and I can tell you it was a very difficult decision to make. 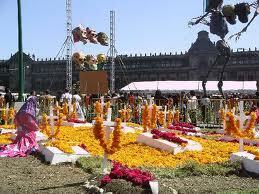 Dr Cath Andrews is a historian who lives and works in Mexico City. She is writes about nineteenth-century political history and is interested in feminism and women’s issues.